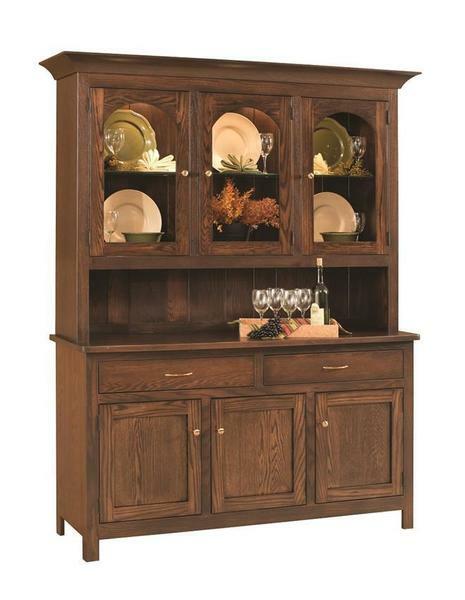 The curved glass doors and tapered molding of this stunning Georgetown hutch are features that will help bring style and classic elegance to your home. Have it custom built to your personal style and home decor preferences for a unique one-of-a-kind piece of Amish hand craftsmanship. With a variety of custom options to choose from right here on our website, you are sure to design the perfect hutch for your home. Contact one of our friendly and talented Amish furniture consultants for additional information or custom ordering assistance on this beautiful American made hutch.